So far only a concept. Volkswagen’s Taigun concept could soon become a production reality after the manufacturer unveiled a revised concept in January 2014. Based on the Up platform, the Taigun could compete against the Ford EcoSport and cost in the region of £15,000. 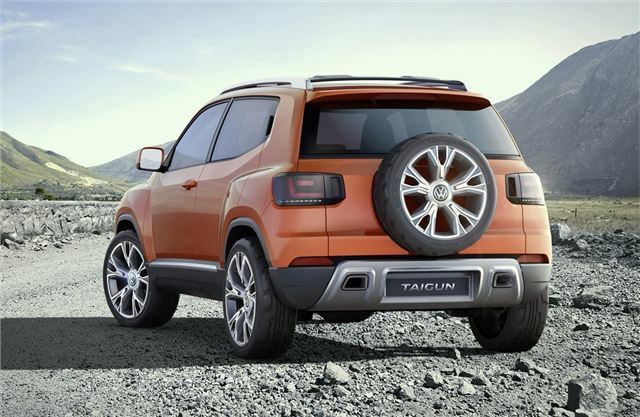 The Taigun concept was first shown to the public at the Sao Paulo Motor Show in 2012, but has been updated with a new boot lid and outside-mounted spare wheel. The four-seat Taigun concept is powered by Volkswagen’s new turbocharged 1.0-litre TSI engine, with 110PS. Fuel consumption for the three-cylinder unit will be around 60mpg, while CO2 emissions will be 110g/km. The Taigun will accelerate rom 0-62mph in 9.2 seconds. 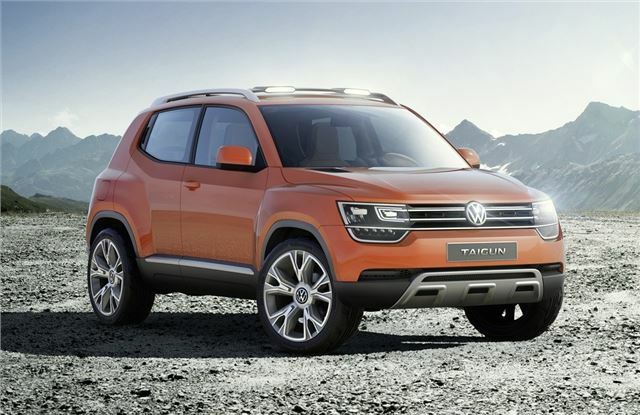 The Taigun’s angular styling is quite comparable to the Amarok and the little SUV gets 17-inch alloy wheels, LED daytime running lights and Volkswagen’s signature grille. The boot has 280 litres of space, which can be increased to 996 litres with the rear seats down. Interior styling is based on a smart phone design, with an integrated touchscreen system and a minimalist approach to the layout. The Taigun also gets honeycomb seat styling and faux leather. Volkswagen is keen to stress that the Taigun is still very much a concept at the moment and no production date has been confirmed. However, with the launch of the Ford EcoSport in 2014, some market insiders say the Taigun could make it to the UK within the next 18 months.